In January, Solidarity welcomed the declaration of Left Renewal—the newly formed left tendency within The Greens. 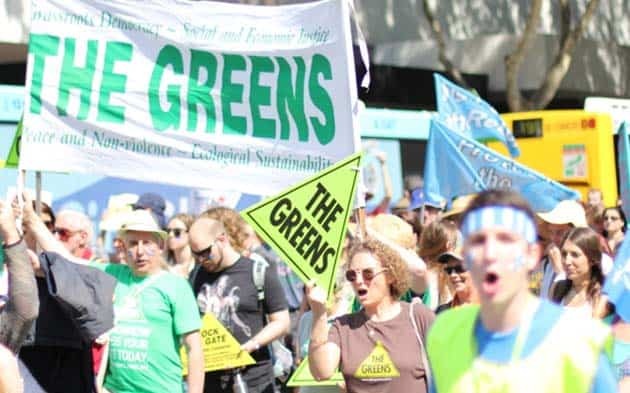 Since then, Left Renewal has held successful public launches in Sydney and Canberra, to showcase its vision for The Greens and begin a badly-needed discussion. Over a hundred people packed into the Sydney Left Renewal meeting at Redfern’s Settlement hall to discuss the future of The Greens and the implications of the right-ward shift in the party for social movements and the left more broadly. One of the speakers, Chris, responded to media attacks from Greens leader Richard di Natale that Left Renewal members should “consider finding a new political home,” telling the meeting that that, “socialist, anarchists and radicals had always been part of the party”. Another speaker, Holly, argued strongly that The Greens need to be anti-capitalist if they are going to capture the radical mood that has seen young people flock to support socialist Democrat Bernie Sanders in the US, and a resurgent left movement backing Jeremy Corbyn in the UK Labour Party. But, just days after the launch, the right of the party escalated its attack on the left. Former leader Bob Brown hit a disgraceful new low calling Lee Rhiannon the, “Tony Abbott of The Greens when it comes to political white-anting”. Brown’s brazen attack is astonishing given the white-anting he and another former leader, Christine Milne, happily carry out for Richard Di Natale. At the same time, behind the scenes the right continues to gain ground. The Greens’ January National Council meeting broke with protocol to hold an “in camera” session and pass a motion against factions—a blatant attempt to intimidate Left Renewal. Then at the February NSW State Delegates’ Council, despite widespread concern about Dawn Walker breaching party rules and accessing official membership lists to contact Greens members, the left was rolled by a single vote when it moved to overturn her pre-selection win. Walker will now join Jeremy Buckingham and Justin Field as part of the right Greens bloc in the NSW parliament. The left lost another opportunity at the SDC meeting, when, under pressure from the right for a consensus resolution, the meeting backed away from a motion explicitly condemning Bob Brown’s attack on Lee Rhiannon. Left Renewal has come under a lot of pressure for bringing the fight against the rise of the conservatives into the open. But the determined action of the right to consolidate their hold on the party shows why the formation of the faction has been so necessary to defend party democracy. The new group has its work cut out to reach out to rank-and-file Greens members and supporters, and build a base in the party. There are promising signs that the wider left in the party in NSW is also recognising the significance of the stand taken by Left Renewal to defend the party’s principles. There are good opportunities in the period ahead. Building a solid Greens contingent for the Palm Sunday refugee rally can be a good step towards mobilising The Greens as an activist party, and organising Greens members to fight the racist right—be that Turnbull, Hanson, or Trump. This outward-looking focus allows space to engage wider layers of Greens members in the debate over what sort of party The Greens should be. The “Standing Up For Communities: No Bans, No Hate” meeting with Lee Rhiannon and Mehreen Faruqi at Granville on Sunday 5 March, is another opportunity to mobilise Greens members and tap the growing concerns about Trump and Turnbull’s racism and Islamophobia. There are many other opportunities to respond politically to the conservatism of The Greens leadership. In a couple of weeks, 937 people signed a petition initiated by Solidarity condemning Di Natale’s characterisation of calls by Aboriginal activists to oppose Australia Day and burn the Australian flag as “violent”. Similar public responses are needed to Bob Brown’s attacks on Lee Rhiannon, and the National Council’s “anti-faction” resolution. Combined with efforts to mobilise members and supporters, such responses can both expose more clearly what is at stake in the fight against the right, and what a fighting left Greens could look like. The wider Left can only gain from that. I welcome the existence of the Left Renewal. I’ve been saying it for years but I’ll say it again: mainstream Greens, we get you’re the professional, knowledge class. We get you’re doing really well out of global capitalism. We get you sing yourself to sleep with notions of pink unicorns, a meritocracy and how everything would be just lovely if only the bigotted working and lower middle classes got themselves educated and welcomed gay marriage equality but I’m afraid we have other inequality issues down here in the unwashed masses. We’ve judged you and found you seriously wanting. Get out of the road if you can’t lend the left a hand, liberals. You’re dead weight. I looked up this site in response to the recent controversy about the Greens. As far as I can see Left Renewal is just another Marxist sect. I use the word “sect” advisedly -like all of the other Marxist sects, Left Renewal is just another Marxist religion. fiercely arguing points of doctrine with other Marxist sects. I realised this when I was at Uni – I bought a copy of a newspaper called Socialist Action. I think that it was produced by a Trotskyite Marxist sect. It spent much of its time arguing the One True Belief with other Marxist sects (Stalinists, etc). My political views are to the Left. I vote ALP in Federal elections and think that it is important that all Left-leaning people co-operate to ensure a better society for all. Until now I have voted Green in NSW elections. This will stop unless Left Renewal can convince me that it is not just another Marxist sect but rather is an organisation which can work constructively with other Left organisations for the greater good. I have no expectation of a coherent response to this – debating with members of cults/sects is usually futile but I live in hope. We don’t speak for Left Renewal, but they are not some fully formed Marxist grouping. They are basically a group of young student activists and although I don’t think they have done everything correctly their emergence is a response to a wider series of debates in The Greens in NSW in particular. Left Renewal is a very small force in The Greens. The reason they have gained publicity is that they are the only grouping thus far who have been prepared to publicly criticise The Greens’ drift to the right on a continual basis. I was interested in its reference to Jeremy Corbyn. One of the reasons that he did well in the recent UK election was that his ideas about how the UK could be made a better place for all appealed specially to young voters – whether or not they were “working class” (whatever that means) or came from working class areas did not matter. As a personal aside, recently a young couple moved into the house across the road from me. The guy is a plumber and his partner is a hairdresser. They are good neighbours and I certainly don’t think of them as “working class” because of their jobs. More generally, in the complex world that we live in I don’t think that making an arbitrary binary distinction between “working class” and something else (“non-working class”(?)) is a helpful one. Marxists don’t see class as being about status. We define the working class as those who have no choice but to sell their ability to work to an employer. That has consequences. Workers are paid less than they produce (ie, they’re exploited) and employers, under pressure to compete, will try to increase the rate of exploitation. The result is that workers resist and tend to learn the value of collective organisation (primarily unions) as they can rarely fight back effectively as individuals. So describing someone as working class helps explain their likely behaviours — they’re more likely to go on strike, for instance. If your neighbours are self-employed, they’re less likely to join a collective fightback. This is a broad-brush description — there are always exceptions. But it’s true enough for Marxists to look to the working class to lead the fight to rid us of capitalism and free all humanity. The reason I think the concept of the working class is still relevant is that most people’s lives are defined by having to work for a wage, and the sort of job that they do. Class, in the Marxist understanding, is about your relationship to the production process, that is how society produces all the goods and services we consume. They key issue is who controls how production is run. If you are a business owner, or a senior manager, you exercise the bulk of the control about how a workplace is run. This matters because class position can give rise to struggle, most commonly trade union demands over wages, workload, and conditions in the workplace. I think it is primarily such movements outside parliament which give rise to social change. For instance the radicalism of the 1970s, and even the election of someone like Whitlam, was underpinned by mass movements against the Vietnam war, for women’s rights, LGBTI rights, and crucially high levels of strike action. Responding to some of the issues that you raised (to some extent this is a response to James as well). I have no ability to produce material goods so I could not sell this non-existent ability to an employer. So, I had little choice but to sell my abilities as a teacher and scientist to an employer (a University). When I sold my abilities to that employer I was a member of the union and withdrew my abilities, “went on strike”, when necessary. Does this mean that I was a member of the working class? If so, why, if not, why not? I think that both of you tend to view “production” somewhat narrowly as producing material goods, which is part of the Marxist tradition. Consider somebody who has sold his/her ability to an employer who makes cars. That person would not able to use that ability in exchange for wages without access to many other things which s/he does not pay for. These include the abilities of other employees involved in the production process, electricity used in the factory, the cost of the material goods needed to make cars and many others. David, I think that this is where your point “Workers are paid less than they produce” falls down – any employee (the employer does not matter) relies on all of the above unpaid things to sell his/her abilities in exchange for wages. I will end with a philosophical point. Human societies are very complex (different societies in different ways of course). Having a Revolution in the Marxist sense (metaphorically throwing everything up in the air) in the hope that the society will spontaneously re-assemble into a more humane one is very unlikely. The history of the Soviet Union is a case in point. In evolutionary biology this is called the Boeing 747 fallacy. Breaking a 747 into its constituent parts and throwing them all into the air is unlikely in the extreme to make anything which is functional, never mind a better 747. I have no argument with the view that many societies, including Australian, could and should be improved. However, I think that an evolutionary approach (noticing something which is wrong and doing something about it) is the way to go, rather than a Marxist Revolution – in my image above, throwing everything into the air, in the hope that the society will spontaneously re-assemble into a better one.